Infantry and tank reinforcements arrived on the government side to repel the attack in the afternoon, the group said. BEIRUT: Fierce clashes broke out in the Syrian capital on Sunday after insurgents infiltrated government-held parts of the city through tunnels overnight, state media said. It was a surprising breach of Damascus's security perimeter, where the government has effectively walled itself off against two opposition enclaves in the eastern parts of the city. Residents said artillery shells and rockets were landing inside the heart of the city, and the activist-run Damascus Today Facebook group reported government air raids over the area of the clashes. With its military depleted from six years of fighting and defections, the Syrian government relies on a blend of official and semi-official forces to defend its territory, including Shiite militias from Iran, Iraq, Lebanon, and other Middle Eastern countries. The clashes centered on a government-held gap between two besieged opposition enclaves, the Jobar and Qaboun neighborhoods. The ultraconservative Ahrar al-Sham rebel faction said fighters had "liberated" the area. The Levant Liberation Committee — an al-Qaida-linked group — and the independent Failaq al-Rahman faction also participated in the attack. Syrian state media said the military had repelled an attack by an al-Qaida-linked group after "terrorists" infiltrated through tunnels in the middle of the night. Rebels detonated two large car bombs at 5:20 a.m. Sunday close to the Jobar neighborhood. The Levant Liberation Committee claimed the attack. The government has been trying to pressure the rebels to surrender the pockets they hold in Damascus following victories in the northern city of Aleppo, the central city of Homs and other Damascus suburbs. Tens of thousands of fighters, dissidents, and their family members in long-besieged areas have agreed to be relocated to the rebel-held northwest, in what opposition figures have termed "forced displacement." 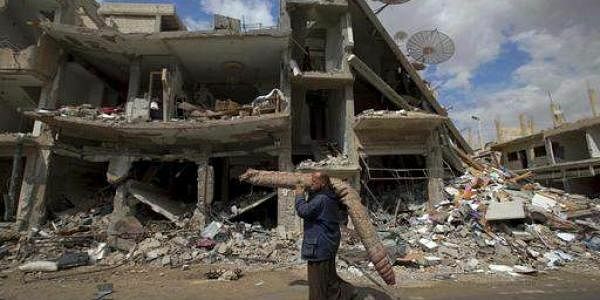 Residents of Homs' opposition-held al-Waer neighborhood began evacuating the city on Saturday after years of siege and bombardment at the hands of pro-government forces. The evacuations are expected to continue for weeks, until the government will be able to claim control over the entire city for the first time since demonstrations broke out against President Bashar Assad in 2011. Jobar is one of three pockets in the Syrian capital still in opposition hands. It has been besieged by government forces since 2013.